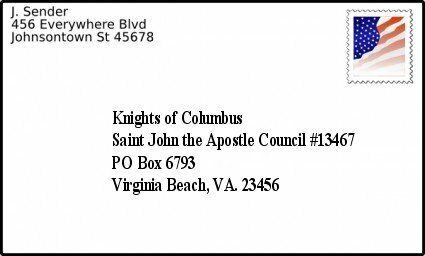 Information about Council 13467 in Virginia Beach, Va.
Council 13467 operates out of St. John the Apostle Catholic Church on Sandbridge rd. All Council meetings are held at St. John the Apostle school located next to the parish. Council Officers meet the 1st Thursday of the month in the school library at 7:00 pm. Business Meetings are held the 2nd Tuesday of the month in the school cafeteria at 7:30 pm. A rosary precedes at 7:00 pm. Knights Night Out are held on the 3rd Tuesday of the month. A different dinner location is selected each month so check the calendar to see the current location. 6:30 pm. This meeting is open to all Brothers and their families. Social Meetings are held on the 4th Tuesday of the month in the school cafeteria at 7:30 pm. This meeting is open to all. We can also be reached by standard postal deliveries using the address shown below. Feel free to mail us. Council 13467 was presented its charter on February 24, 2004 at St. John the Apostle church. We began with a total of 81 members and a full cadre of officers. Please follow the link below to read about our formation and see photos of the charter presentation. Thanks to the inspired work of Father McGivney�as well as that of millions of other Knights over the past century�the Knights of Columbus now stands at its pinnacle of membership, benefits and service. Currently, there are over 1.6 million Knights of Columbus�more than ever before in the Order's history. Together with their families, the Knights are nearly 6 million strong. In addition, from the first local council in New Haven, the Order has grown to more than 12,000 councils in the United States, Canada, Mexico, the Philippines, Puerto Rico, Cuba, the Dominican Republic, Panama, the Virgin Islands, Guatemala, Guam and Saipan. Each year, the Order continues this strong growth. it is about protecting and enhancing your family life. The easiest way to join is to talk to any member of the council and express your desire to learn more or to actually join. He will provide you with a "Form 100" (application). Simply complete the form and submit it to him or any Knight. The Admission Committee Chairman will then contact you to arrange a meeting with the Admissions Committee. They usualy meet on the second Monday of each month in the SJA school. If you prefer a different day, time or location he will gladly make other arrangements that meet your needs. These meetings are normally short and casual and serve the purpose of understanding who you are and what membership in our order can mean to you and your family. You are encouraged to ask any questions you have. Following that meeting, your application is read at the next business meeting and a vote taken to accept/reject your request for admission. Once approved you will be contacted by the Admissions Chairman and informed where and when the next 1st degree (Admissions) exemplification will be held. Normaly a coat and tie are worn and the Charirman will provide all the information needed to make this step a success.